The apartment has beautiful sea and mountain views, and is within easy walking distance of the many bars and restaurants situated within the marina. Located within 10 minutes drive of 8 championship golf courses (including Valderrama), the location is ideal for both family and sporting holidays. 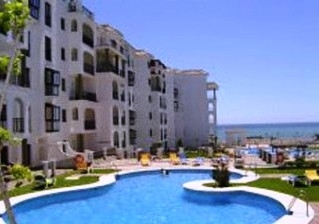 The apartment is in the prestigious Marina de La Duquesa complex on the Costa del Sol. The private gated complex is right on the beach front with four private pools, a sauna, tennis court and small gym, and is set in beautiful tropical gardens. There is a designated secure parking space beneath the complex, and lift access to all floors. 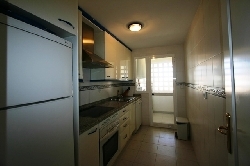 The apartment is on the fourth floor and is fully air-conditioned with marble floors throughout. There are two twin bedrooms, two bathrooms (one with a bath and one with a shower), and a kitchen which has everything you could need including a dishwasher and microwave. The apartment also has its own laundry room with a washing machine. 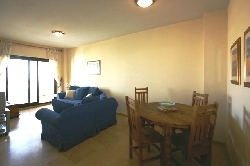 The large sitting/dining room has satellite television and a DVD player for quiet nights in. Through the patio doors there are beautiful views from the balcony of the local mountain range, the blue flag sandy beach and Meditarranean sea. 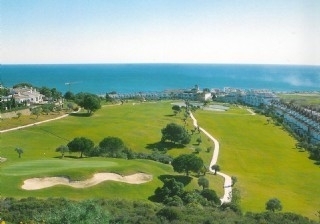 Duquesa Marina is one of the prettiest and unspoilt marinas on the Costa Del Sol. There is good access from both Gibraltar (20 miles) and Malaga (50 miles) via both coastal and toll roads. Gibraltar, Selwo National Park (an African adventure theme park, with wild animals and activities for everyone to enjoy), Bahia Park (a large water adventure and amusement park), Estepona and the famous Andalucian white villages in the hills are all a short drive away.